Thank you all for a wonderful event!! We can't wait till Next Year!!!! 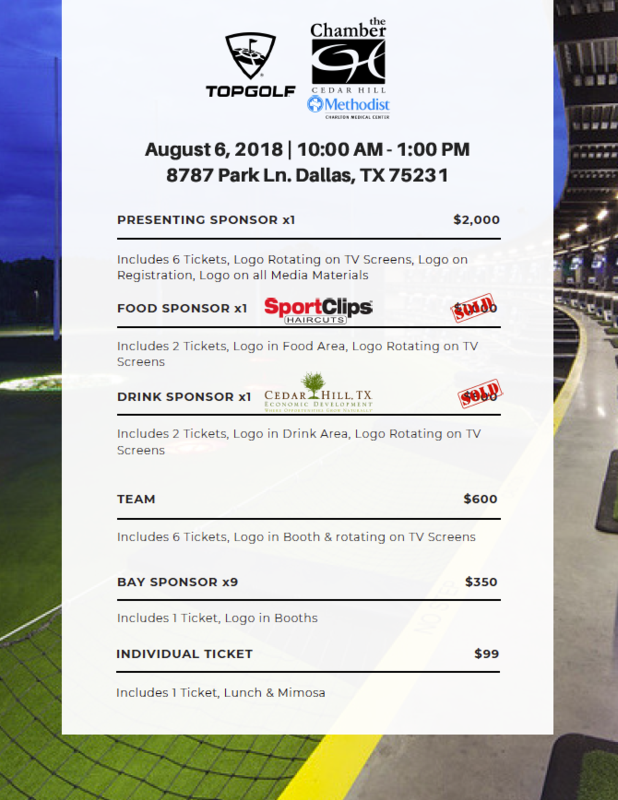 The Cedar Hill Chamber will be mixing it up again this year by going to Topgolf Dallas. This is a fun and relaxing way enjoy golf while also still being able to network and have a great time! We are still the ONLY Chamber in the area to host an event like this!! Another FIRST for the Cedar Hill Chamber!! You can challenge your friends and family to addictive point-scoring golf games that anyone from the hopeful pro golfer to your neighbor’s 7-year-old kid can play year-round. Just picture a 240-yard outfield with dartboard like targets in the ground. The closer to the center or “bulls-eye” you get and the farther out you hit your microchipped balls, the more points you receive. What if I don't golf? Topgolf U provides a Topgolf Instructor who will elevate our event by providing best-in-class instruction and bay assistance to our guests while delivering a fun and memorable experience. Do you like good food? Do you enjoy refreshing, cold beverages? How about hanging out with your buddies while getting some fresh air? If your answer to any of these questions is yes, then you’ll have a great time at Topgolf. Most people who play the game don’t even call themselves “golfers.” Trust us, we’ve done extensive marketing research. Anyone can play and compete, so no need to be intimidated. What if I'm a Pro Golfer (even just in my own mind)? Great question! They have a number of games that will put your golf skills to the test. From chipping to driving, you’ll be able to improve every aspect of your game. Is this outdoors or indoors? All of the above! The bays are climate-controlled with infrared heaters when it’s chilly and fans and cooling water misters when it’s a bit steamy. Oh, there’s also seating for up to six people in each bay and very friendly servers who will bring you tasty food and refreshing drinks. Nope, they’ve got plenty of clubs for adults (men and women) and kids. They even have clubs for the lefties. Want to know the best part? They’re free to rent. If you’re really serious about dominating the competition or just want to show off your golf bling, feel free to bring your own. What do I get for my Ticket price of just $99? That price includes your entry/greens fee. Can I put together a team ($600)?